Article reprinted with permission from Cleveland Jewish News. Orange resident Yael Amitz-Lev Sperber is familiar with the type of positive impact the Jewish Federation of Cleveland can have on people’s lives. After all, she benefited from the organization when she relocated to the Cleveland area from Israel three years ago. That’s why she donated her time the morning of Oct. 14, during Super Sunday, to ask for pledges and help ensure others can share in those types of experiences. As the day came to a close, the Federation exceeded its goal by raising $1,083,340 in pledges from 1,452 donors during the giveathon. Though that amount fell short of the Federation’s Super Sunday record of $1,119,103, it marked the sixth consecutive year the agency has secured more than $1 million during the event. 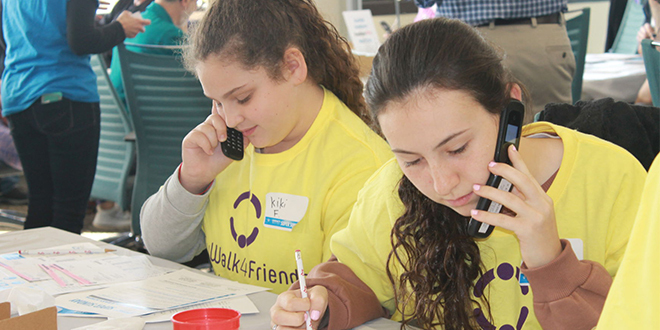 To raise those funds, which go toward the Federation’s 2019 Campaign for Jewish Needs, nearly 1,000 volunteers made phone calls and requested pledges during various shifts in a 10-hour day at the Federation’s Jack, Joseph and Morton Mandel building in Beachwood. Pledges received were increased due to a matching-donation program by KeyBank, which was also a sponsor of the event. The giveathon is the largest single-day fundraiser for the Federation’s campaign, which is an annual fundraising initiative that raises money for local, national and international Jewish needs. Throughout the day, volunteers enjoyed kosher snacks and music from the Hebrew Academy of Cleveland Boys Choir. They didn’t even have to miss the Cleveland Browns’ game as it played in the background while volunteers solicited pledges. Brian Stein, a Super Sunday co-chair, said the event offers an opportunity to connect with those who may not be as involved in the Jewish community. Stein has personally seen the impact from the funds raised through his children’s attendance at Gross Schechter Day School in Pepper Pike. “The Federation is the biggest support of that and makes it very affordable for a Jewish education for our children,” he said. Dayna Orlean, 30, of Lyndhurst, was seated at a table with other young Jews prepared to ask for pledges. However, unlike other tables, they used emails, texts and social media instead of making calls. Orlean said many younger Jews are less likely to answer the phone if they don’t recognize the number. Yet, if the same person saw an acquaintance on social media promote pledges, the thought is they’d be more likely to donate. The event reached 313 new donors, which Abbie Levin, vice president of development, said is due in part to using social media platforms to offer alternative avenues to donate. This was the first year that strategy was used during Super Sunday, and it happened because volunteers expressed interest in taking the cause online. The Federation cropped pictures for Orlean and other volunteers to post on top of their profile photos to help promote the event. The Cleveland Jewish News was a sponsor of Super Sunday.